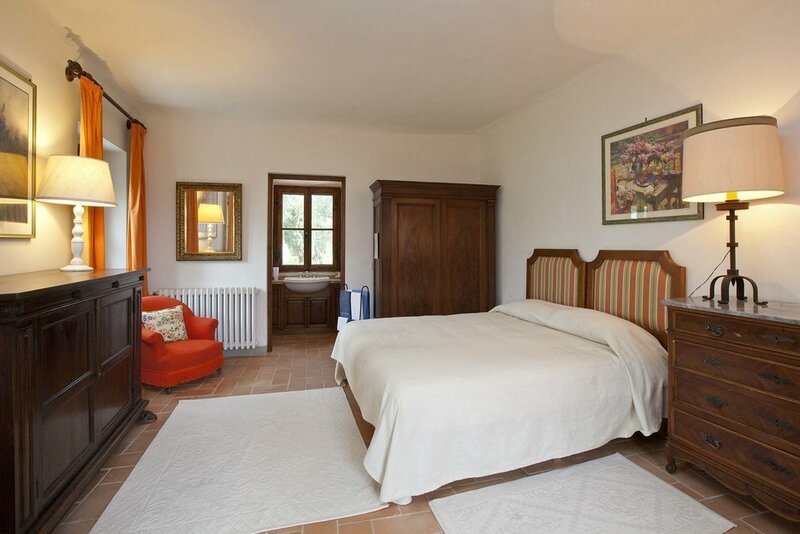 La Cantina is an apartment in the main villa of Capitignano, a short walk from the pool. It consist of a bedroom, living/kitch and bathroom. In front of the entrace guests of la Cantina have a parte of the garden with own table, seats and umbrella. The 500 books lining the walls are part of Prof. Aeschliman’s library. The Casetta is a small guest house sitting on a hillock just below the Fattoria, protected by a hedge to ensure privacy. It is ideal for two people. The split-level interior space extends on to two spacious terraces exposed to the sun throughout the day. It is centrally heated for winter use, but the wood-burning stone fireplace is an appealing attraction at any season. A wood-paneled modern kitchen blends in with the rustic decor. 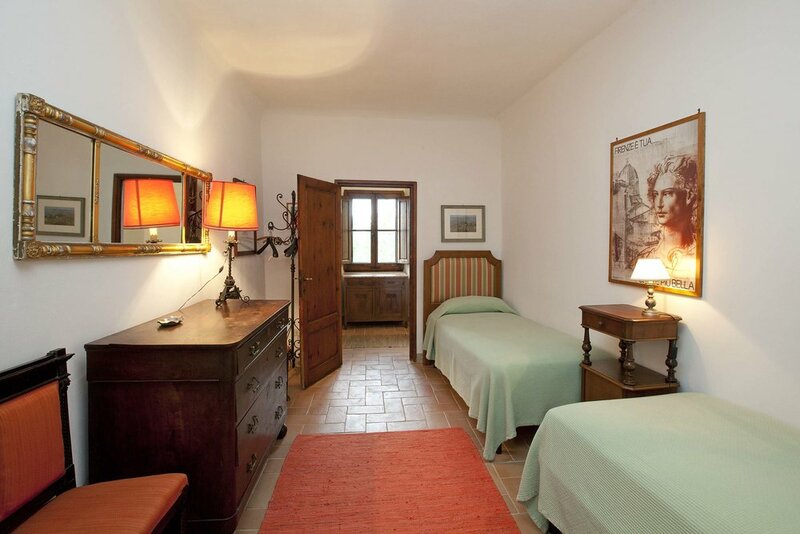 Casa la Stalla has two large rooms, one with an attic above the kitchen and bathroom area; the other room has a double bed in one half and the sitting area near the fireplace in the other. The loggia has a large dining table and view of the main villa. You can sit outside on the west terrace or on the northwest terrace, both with beautiful views and the sunset. Washing machine is available. La Capanna is a farmhouse with private terrace on the lower level. The construction reflects the original purpose of the building; a hayloft. The building is totally renovated. The living room offers a view to the north. 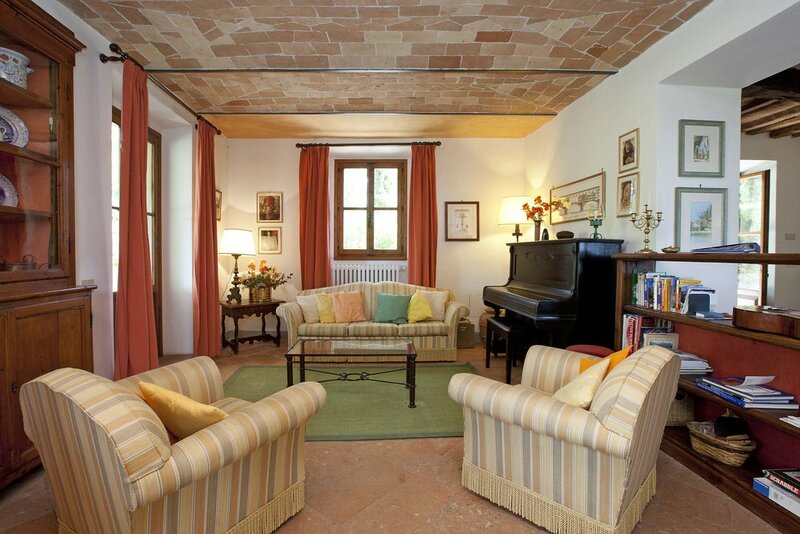 Casa il Fienile is an independent house with a surface of 180m², divided over two floors. There are 2 bedrooms with 2 bathrooms on the lower floor. On the upper floor, there is a large living and dining room, with a screened-off sleeping area towards the back. The large kitchen is at the entrance, with a bathroom. There are private terraces in the front, side, and back with stunning views over the hills. 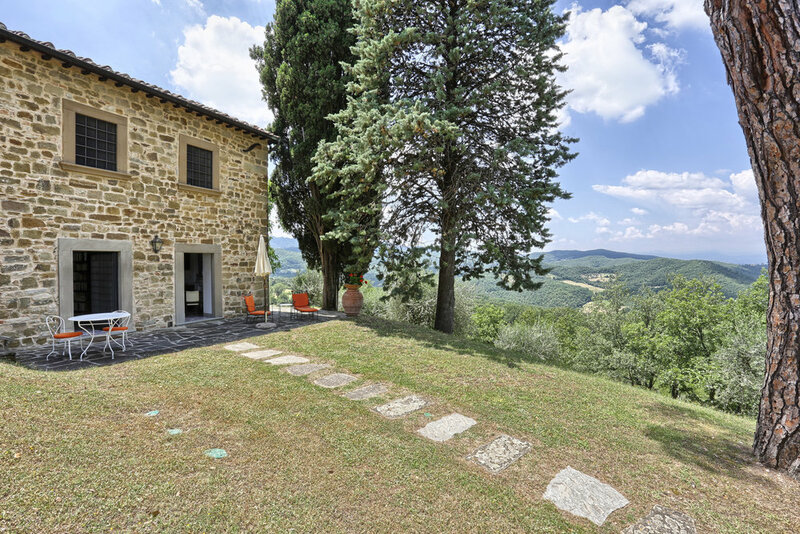 The Fattoria, the largest of the buildings, contains two large double bedrooms, one of which has a balcony with a splendid view, two small double bedrooms, 4 1/2 bathrooms, a kitchen, and a dining and living room with fireplace. There is a large terrace with a magnificent view for relaxing and dining "al fresco". Washer and dishwasher are available. The Fattoria has its own courtyard and forms a separate and private part of a farm complex in which the caretaker and his family live.